Beachcomber Hotel and its sister Hotel the Blue Lagoon are located on Chaweng Beach, eastern shore on Koh Samui island. 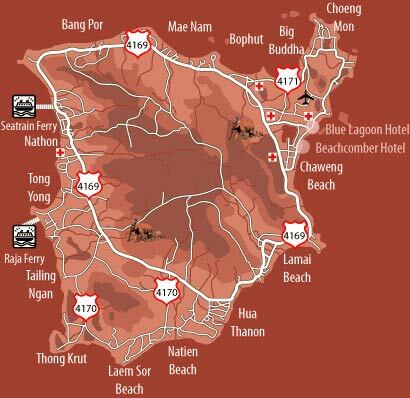 We are right in the heart of Chaweng and thus close to large shopping and entertainment areas in Samui. The Blue Lagoon Hotel lies at the northern and quieter end of Chaweng. If you wish to visit our sister Hotel you can do so. We offer a free taxi service between the both hotels from 9am until 11pm. We are a 4-star property nestled in a tropical garden of palm trees, lush bushes and flowers that provide casual relaxing atmosphere. We have a total of 51 superior rooms and 2 Junior Suites in our five 2-storey buildings. All 51 superior rooms are situated in the U-shaped Thai style main buildings around the exotic gardens. They are equipped with Thai style teakwood furniture, one single bed and one double bed, air conditioning, satellite TV, IDD telephone, mini-bar, tea and coffee making facilities, free drinking water, hairdryer, safe, umbrella, balcony or terrace. The bathrooms have been renovated with marble and granite and they all content a bathtub. 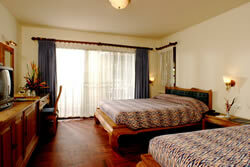 The superior rooms are with garden or pool view.